My name is Joyce Edwards, but before I married I was known as Joyce Endersby. I was born in 1924 in Wheathampstead. My father was the village policeman and I was born in the police house. I was christened in the village church and married there in 1947. I had a happy childhood and attended St Helens School. I remember Mr Housden, Miss Young, Miss Warren and Miss Crawley. I was fond of them all. When I was about 9 years old, the older children at the school were asked to “buy a brick” with our names on, these bricks were to go around the inside wall of the new school which was to be built. I wonder where these bricks are now? The girls I spent most of my time with were Rosemary Milton, Rene Field and Joyce Pearce. Rosemary lived at the bottom of Brewhouse Hill and Rene lived on No Mans Land Common. Joyce Pearce lived opposite Rosemary, I think she married Ted Westwood many years later. My father retired when I was 6 years old and we moved to the 1st Necton Road. It was a nice big house. My father had a horse and with a flat cart used to sell vegetables and fruit to the outlying villages. The Westwood's lived across the road from us and just higher up lived Amy Hawkins, the district nurse, a wonderful woman. Ted Westwood and I use to spend time going to see his father, a blacksmith in the Bull public house yard. We would also go to a small field along Marford road where they kept chickens and Ted had lots of tame rabbits. When I was 9 years old, my father died and we moved to 76 Marford Road. The houses had just been built. A Mr and Mrs Pateman lived next to us for quite a few years. When new shops were built in the village, the Patemans moved into the Vegetable Shop. Mr and Mrs Cobb became our new neighbours. Mr Cobb put on many local shows for the villagers for many years. At 17 I joined the WAAF and spent nearly 5 years in uniform. I married and left the village to move to Stoke-on-Trent. My brother Henry, known as Jim to everyone, lived in Buckinghamshire and my sister Eve lived in St Albans, Gustard Wood and eventually moved to Calne in Wiltshire. My mother Kate though many people called her Kit was well known in the village. When my mother became ill she came to live with me and for many years I kept in touch with Mrs Cobb and Kath Freeman until they died. My two friends taken in R.A.F. Shawbury in 1943. From the left Pauline Smith, then me and Penny Davies on the right. From left to right - My sister Eva, my brother Jim and me in uniform. Taken late 1947. My three children spent many school holidays at Marford Road. I have returned to the village for the odd days, but always feel like a stranger. The Swan pub and Charlie Collins Antique shop were the same, but where I was born has long gone and the houses on the Wick had disappeared. 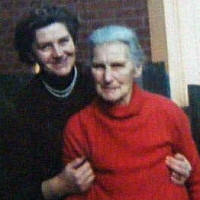 Me and Mother (Kate Endersby) when she was living with me in Stoke-on-Trent.